Captain's Log Starship 1XE, day 5 in the month October, Earth Calendar year 2017. I'm not sure how many of you have seen the ESPN C'Mon Man segment - it is always entertaining. It highlights a blooper reel of outrageous acts of misjudgment, miscalculations, or plain old fashioned hiccups in routine sporting events. My most recent series of flights overlapped with a number of national and international calamities that brought this show to mind. Hurricanes in Florida, Puerto Rico and Ireland, and extreme fire events certainly should get our attention, and invoke serious dialogue and discussion. Are these events related? Brought on by a changing climate? C'Mon Man! Our mission was to fly the recently doused 2017 fires in Montana and the landscapes of 2016's extreme fires in Idaho. Based on current scientific data, these fires were intensified as a result of drought, higher than historic winds, and a general warming of the planet. The weather is something I deal with daily as a pilot, so I pay attention. I really pay attention. A strong cold front brought winter conditions to the mountains the day I was due to take off for the northern Rockies. After delaying for a day, I departed in instrument conditions through a thick fog layer that had descended upon our home base in the Roaring Fork Valley. Once at altitude the skies cleared and it was smooth sailing to Boise, where I was meeting representatives from one of our premiere conservation organizations, The Idaho Conservation League. Our flight missions with ICL included flying reporters, scientists, land use managers, motorized vehicle recreationists and conservationists, an eclectic mix, over some of the wildest country we have in the lower US, the Frank Church River of No Return Wilderness. We flew over the Thompson Creek Mine nestled in the heart of Salmon River country which historically has not had a great record regarding water pollution in one of our most majestic watersheds, and we looked at the possible ramifications of a new mine, the proposed Stibnite, which could also negatively affect water quality and require extensive road expansion in one of our most remote areas. Another day, another mission, this time concentrating on the 2016 Pioneer fire in Idaho that burned over 188,000 acres. Our passengers were amazed at the extent of the fire and the sobering fact that a fire that started in July could not be contained until the winter snows arrived in November. Boise Forest Coalition's statement after extensive examination of the fire is that "climate change, which is gradually drying out and lengthening the burn season, increases the odds and fuel supply of large fires." The next day I was off across the vast wilderness to Missoula, Montana, but again the weather was not cooperating as planned. The best laid plans of planes and men often go awry, and I had to follow river valleys and roads, few and far between, to get to my next destination. Many of these valleys were enshrouded with fog and covered in a fresh blanket of snow, and navigation again became the all-encompassing priority. We waited for the clouds to lift and then flew deep into the Blackfoot Clearwater region (of Robert Redford A River Runs Through It fame) to look at the Rice Ridge and Liberty fires. 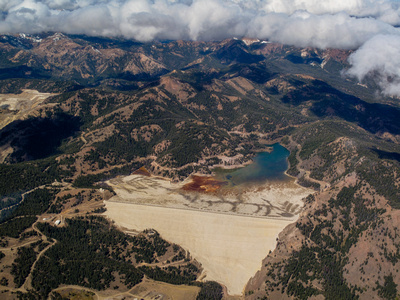 Scientists, forest ecologists, fire managers, US Forest Service officials, landowners and conservationists filled the plane and we got a first-class bird's eye view of the culprit that was obscuring our pristine perfect Colorado blue summer skies. Yes, the jet stream carried the remnants of these majestic forests in the form of smoke all the way down to Colorado, and sometimes down to the northern border of Texas. Well, climate change might be the elephant in the room in our country, but whether it is the 2017 record-breaking hurricane or fire season, something very serious is going on, and needs to be addressed immediately. C'mon man..